If you are ready to experience Pensacola Beach like never before, then you are at the RIGHT place!!! 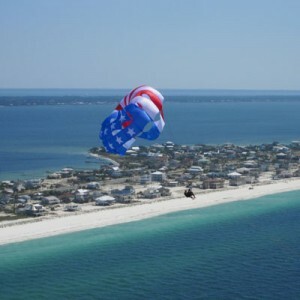 Radical Rides offers the SAFEST AND MOST AWESOME parasail on Pensacola Beach. You will soar over the sugar white sands and emerald blue waters that have made our beach famous! If you are lucky, you might catch a glimpse of a dolphin, a sea turtle, an eagle ray or one of the beautiful birds that call Santa Rosa Sound home! 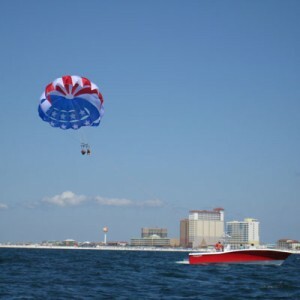 Radical Rides is the only business on Pensacola Beach that operates two NEW Ocean Pro 31 parasail boats. These state-of-the art winch boats are United States Coast Guard inspected to carry 12 passengers. Our parasail boats and equipment receives a rigorous annual inspection and certification from the manufacture and USCG, as well as daily maintenance checks. This equipment meets or exceeds all of the industry safety standards. All of our captains hold a USCG 100 Ton Master License and have over 30 years combined experience! They have flown hundreds of thousands of flights and are, without a doubt, the SAFEST ON PENSACOLA BEACH. Radical Rides captains are CPR/First Aid certified and are members of the American Professional Captains Association (APCA) Drug Consortium for random drug testing. They have also received training from some of the top professionals and manufactures in the industry! 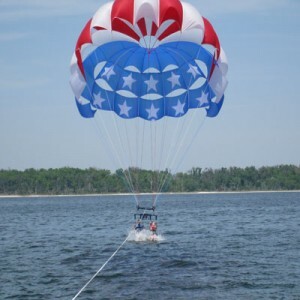 So now that you know you are at the BEST place to parasail…..let’s get started! HERE ARE SOME FACTS THAT YOU NEED TO KNOW! TYPE OF RIDES: We do single, double and triple rides. The double and triple rides are side by side. TAKE OFF/LANDING: Take off and land, safe and easy, from the back deck of the boat. You can stay dry or be dipped in the water before landing back on the boat. HEIGHT: We have 1,200 foot of tow line and you will be about 500-600 feet in the air. AGE: Parasailers must be at least 3 years old. WEIGHT: The maximum combined weight per flight is 450-500 pounds. These amounts can change depending on the wind conditions on the day you fly! ATTIRE: Since there is a chance you might get wet, we recommend that you wear your bathing suit or shorts. No shoes are allowed on the boat, so leave them on shore. During flight you will have on a life jacket and a parasail harness. Don’t forget your sunscreen! TIME: The flight time is approximately 10-12 minutes. RESERVATIONS: RESERVATIONS ARE RECOMMENDED! We have two parasail boats that usually leave on the hour. A charge card number is required to hold your reservation and you must arrive at least 20 minutes before your departure time! We require a 24 hour cancelation notice or your card will be charged. Walk ups are always welcome! Please call (850) 934-9743 to make your reservation. PICTURES: We recommend that you bring your camera and let the crew member use it to take pictures from the boat. You might also want to bring a disposable camera to take pictures in the air! PASSENGERS: Passengers are allowed on the boat, if there is room, for a minimum fee. All parasailers get preference over the passengers! WAIVERS: All participants must sign a waiver. This includes the parasailers and the passengers on the boat. 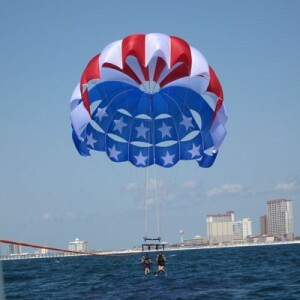 A copy of the parasail waiver can be found on the WAIVERS page. If you are bringing any minors on vacation with you that are NOT your children, please have the parents sign and notarize the forms so THEIR children can parasail. WEATHER: Parasailing depends on weather and wind conditions. We cannot operate in winds greater than 20 MPH or when lightening or storms are approaching. In the event this happens, the captain will make the decision to continue or stop parasailing. If weather conditions become unsafe and we stop parasailing, you can either reschedule your ride or get a refund. SAFETY: YOUR SAFETY ALWAYS COMES FIRST AT RADICAL RIDES!!!!! PLEASE TAKE A LOOK AT THE PARASAIL SAFETY VIDEO. WOMEN WHO ARE PREGNANT MAY NOT PARTICIPATE IN THIS ACTIVITY. GUESTS WITH HEART, LUNG AND BACK PROBLEMS MAY NOT PARTICIPATE. ALSO, GUESTS WHO HAVE BEEN DRINKING ALCOHOL OR WHO ARE UNDER THE INFLUENCE OF DRUGS MAY NOT PARTICIPATE.